At 252 feet long (77 meters) from nose to tail, the 777X is the longest passenger jet Boeing has ever produced. 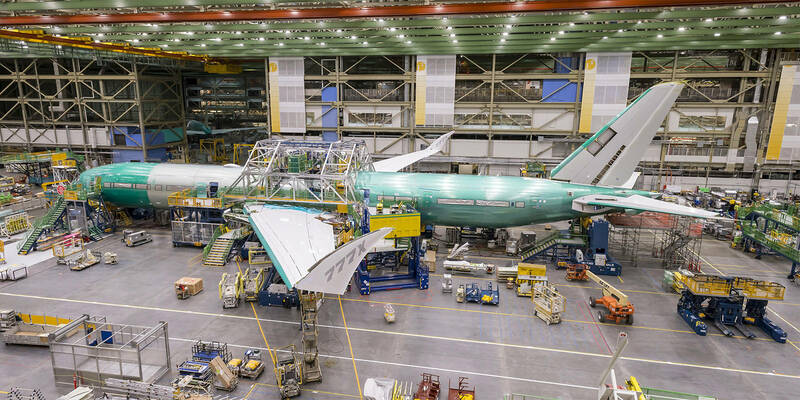 Boeing has brought together the major fuselage sections and turned on the power to the first 777X airplane that will take to the skies in 2019. In a major production milestone called ‘final body join,’ Boeing teams connected the airplane’s nose, mid and aft sections in the company’s factory in Everett, Wash. The jet now measures 252 feet long (77 meters) from nose to tail, making it the longest passenger jet the manufacturer has ever produced. The 777X builds on the market-leading 777 and the 787 Dreamliner to offer airlines the largest and most-efficient twin-engine jet in the world. The airplane provides 12 percent lower fuel consumption and 10 percent lower operating costs than competing airplanes. The 777X achieves the unprecedented performance through the introduction of the latest technologies such as the most fuel-efficient commercial engine ever, the GE9X, and a fourth-generation all-new composite wing design that provides lift and efficiency. With the extension of a set of folding, raked wingtips, the airplane’s wing spans 235 feet (72 meters). By adding folding wingtips, the 777X’s wingspan has been increased to enhance the aerodynamic efficiency of the wing, reducing engine thrust and fuel use. Additionally, the folding wingtips allow the 777X to maintain airport compatibility with the existing 777 family, adding value for customers. The first 777X introduced will be the 777-9 model, which can seat 400 to 425 passengers in a standard configuration and offer a range of 7,600 nautical miles (14,075 km). Boeing is building on the passenger-preferred interior of today’s 777 innovations to create a passenger experience like no other. Passengers will enjoy windows that are larger and located higher on the fuselage than the current 777, along with a wider cabin, new lighting and enhanced architecture. For information about the 777X, go to http://www.boeing.com/777x/reveal/. To date, Boeing has won 340 orders and commitments for the 777X from several airlines, including All Nippon Airways, Cathay Pacific, Emirates, Etihad Airways, Qatar Airways, Lufthansa and Singapore Airlines.